Every kitchen needs one of these! 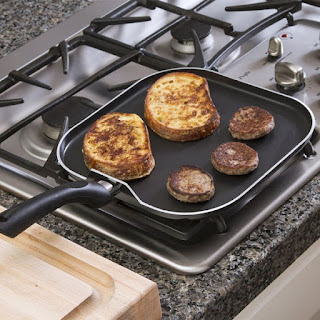 Right now get this Cooktop and Stovetop Griddle Frying Pan for only $17.99 (Retail $49.99). Shipping is Free on this deal. BUY ONCE, ENJOY FOR LIFE: This top notch grill and stovetop griddle pan is made of extremely durable aluminum which makes it oven safe to 350 degrees Fahrenheit. The heavy duty construction assures even heat distribution, effectively reducing hot spots which cause your food to burn. LARGE COOKING SURFACE: Whether you wish to fry vegetables, grill meat or make a quick, delicious breakfast, this cooktop griddle pan is the perfect choice for you! Featuring a large, 11’’, square surface, it provides you with ample space, giving you the chance to unleash your imagination and make unique dishes! MAKE DELICIOUS SNACKS AND DISHES EFFORTLESSLY: The carefully designed, durable, non-stick coating makes cooking a piece of cake! Allowing for effortless food release and effectively preventing food from sticking on the pan, this flat grilling tray is ideal for preparing anything from snacks to pancakes and gourmet dishes. ERGONOMIC DESIGN THAT ASSURES EASY HANDLING: This professional flat top griddle features a practical design which assures maximum comfort while cooking! The long, dual riveted handle provides a firm, steady grip, helping you easily move, transfer and control your skillet griddle. INCOMPARABLE EASY TO KEEP CLEAN: Forget about scrubbing for hours in order to clean your cooking pans once and for all! This top notch non-stick drip griddle pan is dishwasher safe, allowing you to save time and effort and enjoy maximum hygiene.